I am running the controller with Openflow plugin as instructed in option 1 here (note that currently I am not using the extreme kit). I have installed four features ((feature:install odl-restconf odl-l2switch-switch odl-mdsal-apidocs odl-dlux-core). Unfortunately when i tried to access the apidoc (http://localhost:8181/apidoc/explorer/index.html) it just load the interface but not the docs, and display "406 : undefined http://localhost:8181/apidoc/apis". Can anyone shed some light on this? Note: I have not installed my app as a feature yet, I want to explore what capabilities my app can benefit from restconf. If you are not able to see any interfaces listed in acidic/explorer/index.html, then it may indicate a problem with MDSAL in general. Let's try and determine if this is a problem with MDSAL or Swagger (the kit the explorer is using). Can you access the restconf APIs using curl? What kind of activity can you see in DLUX? When you attempt to access the apidoc explorer are you seeing any errors in the Karaf log? I haven't tried curl, so let me try it. DLUX also has some problem because I cannot see my topology (though it is working fine), I am just seeing the one switch and host added by the l2switch plugin. I thought I would work on one problem at a time, so I didn't bring this up. Yesterday the log was giving me error below, which I am told is a known bug, but it shouldn't break anything. java.lang.IllegalArgumentException: Security Mapping [free access] is already registered. 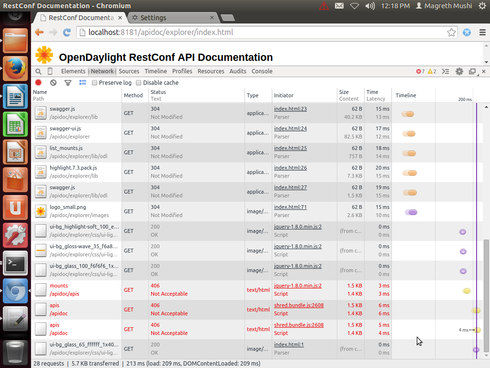 Also, can you tell me a little more about which version of OpenDaylight you are using. You said you are not currently using the Extreme kit. Did you download OpenDaylight from the opendaylight.org Git repo? Or from GitHub? In the left hand side I see Nodes(saying no data) and Topology(contain the one switch and a host), I can not see my simple mininet topology which has a switch and 3 hosts. Here is what I see in the network section of browser. Also, in the official releases of DLUX, the Topology diagram has a dummy host and dummy switch in it. This is a little confusing because they are actually hard-coded into DLUX and not real hosts or switches. We took the dummy host and switch out of the Extreme version of DLUX.